I added onions, garlic, red bell pepper, lemon zest and parsley to the original recipe and replaced cheddar with parmesan. A sprinkling of panko works on top of the casserole. It is my goal to serve more vegetarian entreés this fall and winter, so this fits the bill nicely. 2. Using a large skillet, heat the olive and sauté the red bell pepper and onion until soft. Add the garlic and cook for 1 minute. 3. Remove skillet from the heat and stir in the lemon zest, parsley and oregano. Set aside. 4. Place the eggplant slices in a medium-sized pan and cover with water. Cover and heat until the water boils. Reduce heat slightly and cook until the eggplant is soft, about 10 minutes. Drain and mash the eggplant. 5. Add the mashed eggplant to the sauteéd vegetables. Add the beaten eggs and stir to combine. Add salt and pepper to taste. 6. Pour into a greased shallow baking dish. 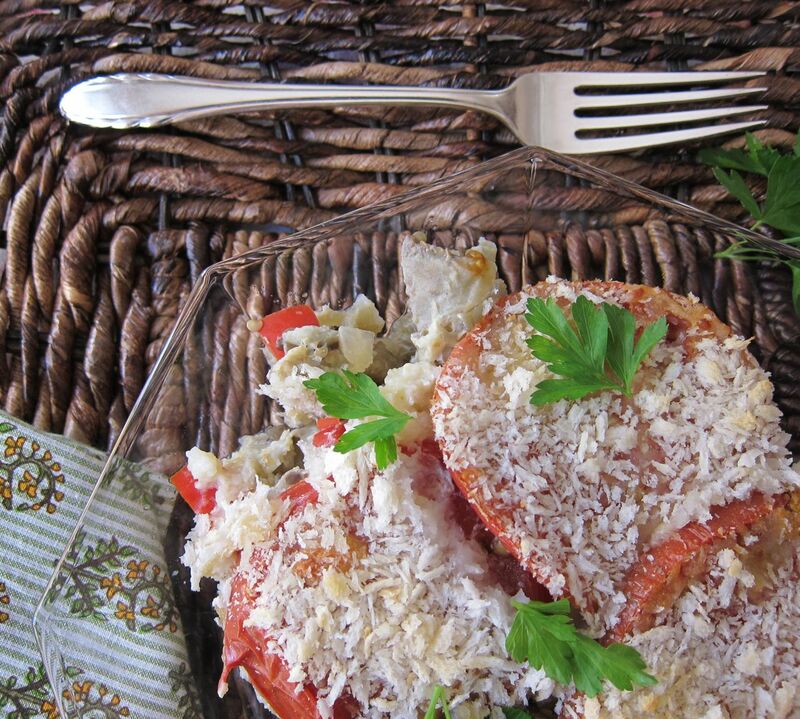 Cover with sliced tomatoes, then the Parmesan. Top with the panko breadcrumbs. 7. Bake for about 45 minutes until hot and bubbling. …and then Anna married Gregory Nava and she and he produced the movie El Norte…. I know Anna’s version of this recipe, but I like your additions – especially the lemon zest. Thanks for the update on Anna! I’m adding this to my eggplant file! It looks like a perfect fall dish! I like the idea of layering the tomatoes on top of the eggplant mixture with the breadcrumbs and cheese. Very nice. It pulls together quickly – I first made this after skiing all day. What a refreshing version of eggplant. I love the lemon in it. Thanks, Lynda – enjoyed your post this morning re the sprouts in a gratin. Looks delicious. I look forward to meeting you at the photography workshop on Saturday! Likewise – can’t wait for Saturday – thanks! Happy to share anything I learn. Baby steps for me. So funny, John-Boy seems the hit of this post – enjoy the recipe. Perfect, Im always looking for new eggplant (aubergine here!) recipes. Its a vegetable I dont use much so need the inspiration, thanks! Ps. I love the Walton’s! Hope you enjoy it, dear Jayne! Another hit in my book Liz! I adore eggplant and this recipe looks to be another keeper! Thanks, Wendy, an easy vegetarian supper. I wish I had hung on to both of them, to tell the truth, but they reminded me of my ex-husband 😉 I kept her flan, though.